This super easy garter stitch scarf was knit with two skeins of Martta the Merino in color Pearl. Yum! It seems like every winter when the weather turns from brisk to seriously cold, big, chunky scarves come out in full force. Look around and you’ll see girls bundled in huge scarves looking like the snuggest of bugs. TJOCKT’s Martta the Merino is perfect for getting in on this chunky knit trend! And the cool thing? Most of these big chunky scarves are knit in garter stitch! Thick and wide garter stitch scarves from Mr. Mittens. Australian brand Mr. Mittens has been the latest to capitalise on this chunky scarf trend. They’re a style blogger darling known for hand-knits that are big and voluptuous. Yum! However, a single scarf will set you back about $175 USD. 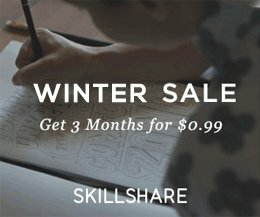 This being a knitting website, you know what I’m going to say: knit one yourself! 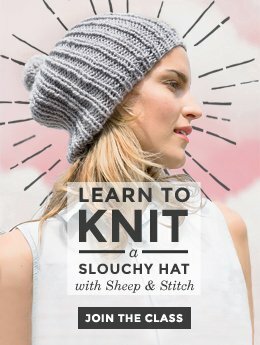 With $175 you can get a bundle of top notch yarn and knit a scarf (or four!) for yourself and family. Holiday gifting done! Not to mention the added enjoyment of cushy yarn gliding through your fingers, which, on a very frosty day, feels like the height of luxury! 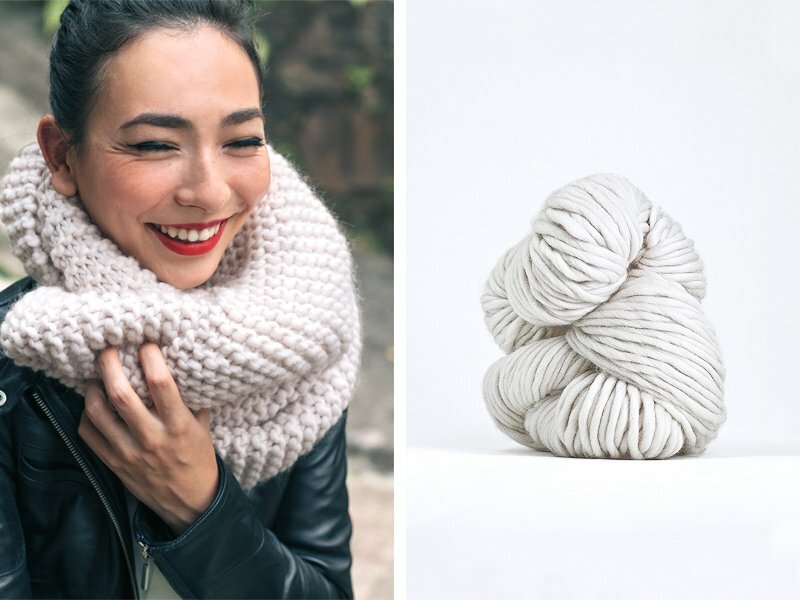 Now before casting on for your own humungous scarf, let’s gawk at some inspiring examples from around the world! 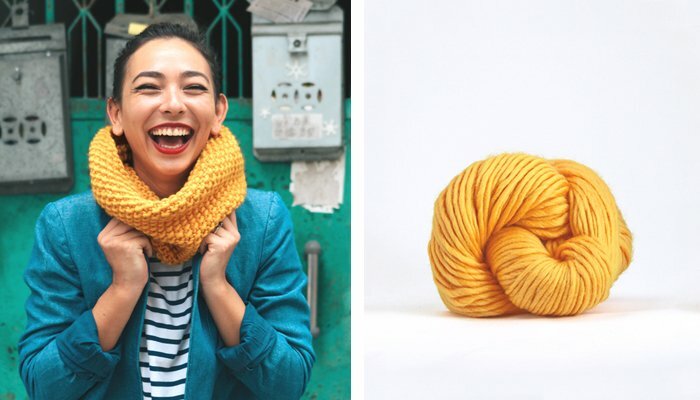 I love how Susie Bubble styles this bright yellow garter stitch scarf! It’s proof positive that you can style multiple bright colors together (in this case, yellow, red and pops of blue) and come out looking modern, creative and quirky – in a good way! 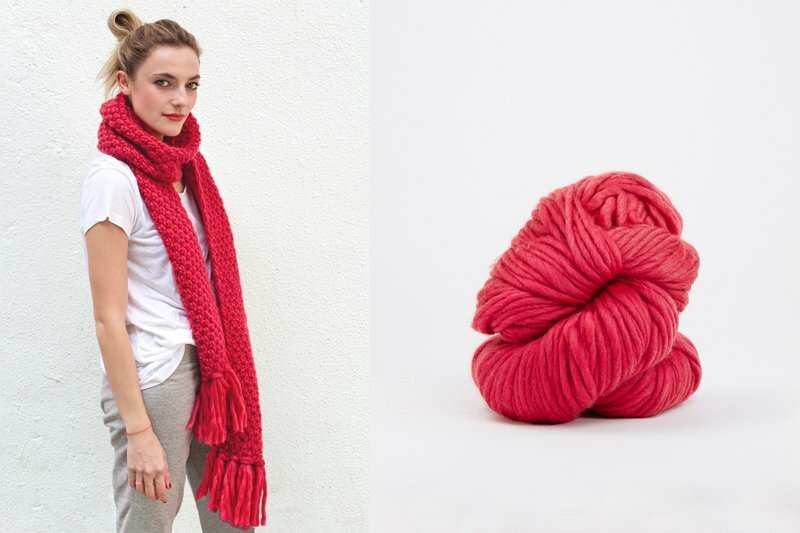 Are you looking to knit a short, skinny scarf with thinner yarn (like the scarf on the left?) 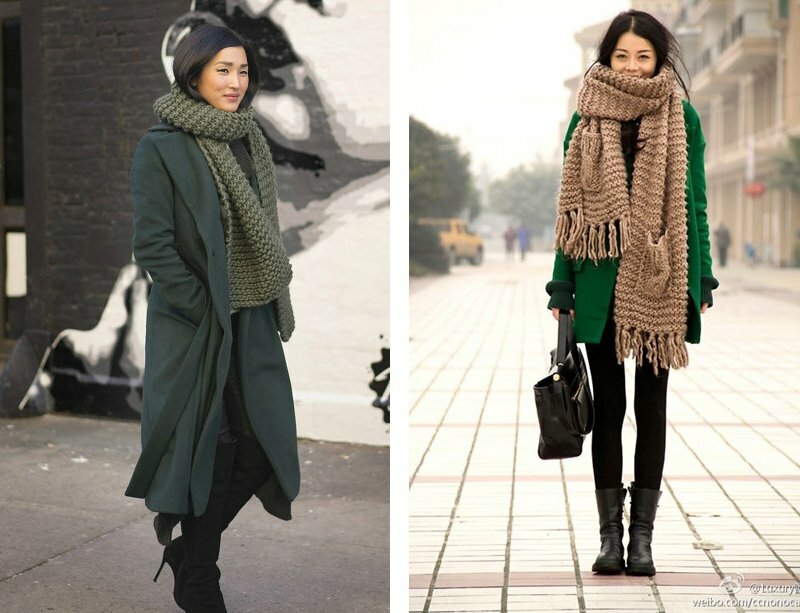 Or a long ankle-skimming scarf that’s as wide as your face (or wider!)? Neutrals like olive, brown and black can blend into most outfits. They make for great wear-with-anything scarves! 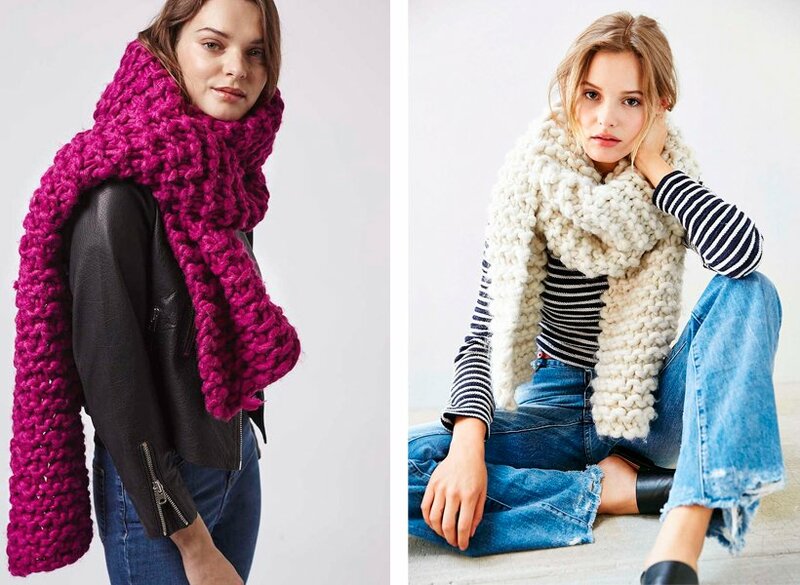 Chunky scarves from TopShop and Urban Outfitters. You can buy one, but why not make one instead? 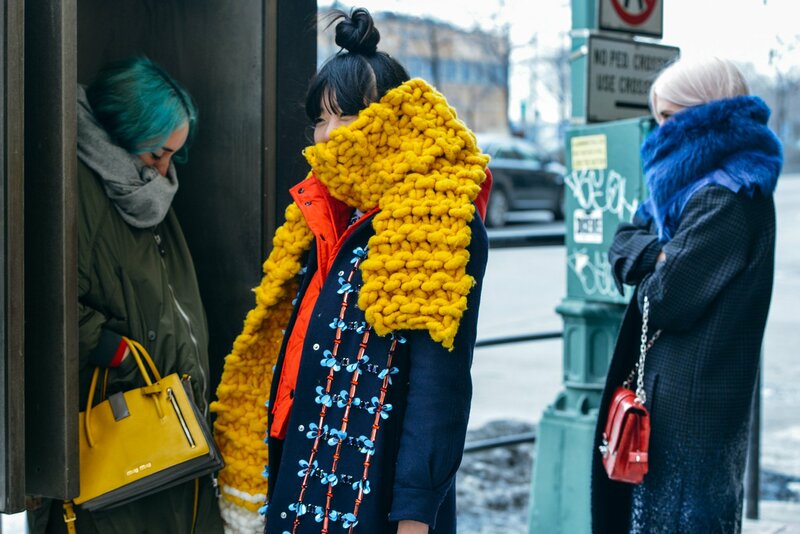 Bright colored scarves makes for terrific statement knits! They brighten up an entire outfit, and they always make me smile. 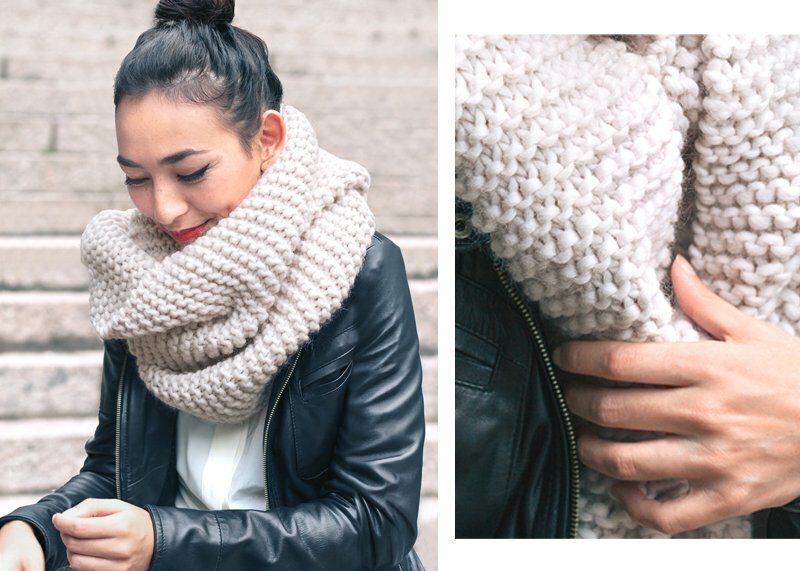 Want to knit your own garter stitch scarf? Check out TJOCKT’s Martta the Merino yarn: a big, fluffy one ply merino that looks perfectly at home knit up in garter stitch. Just two skeins will make a big cozy scarf that goes on for days. Choose from bright green and cheerful yolk yellow to more subdued colors like graphite grey and an off-white pearl, among many others! This Moss Stitch Scarf was knit with two skeins of Martta the Merino in color Poppy. This scarf made with garter stitch (the easy “baby” stitch) was knit with two skeins of Martta the Merino in color Pearl. Just one skein of Martta the Merino is used to make this seed stitch cowl! 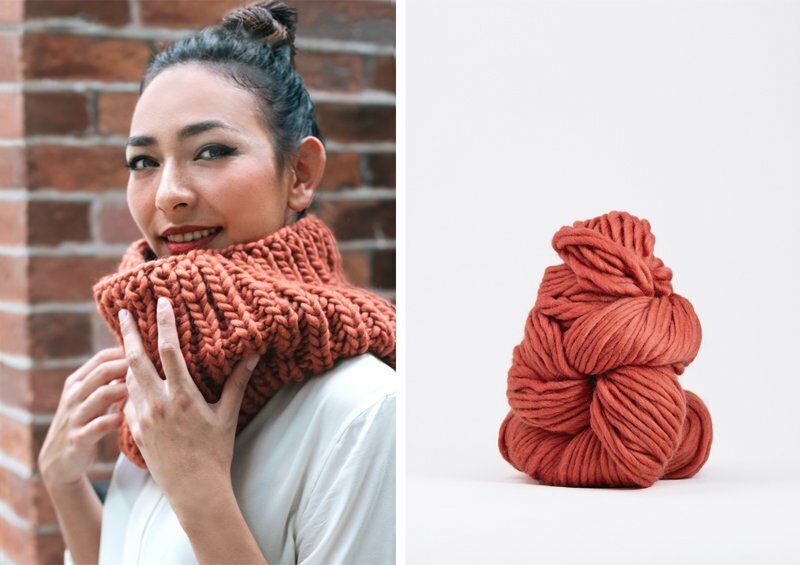 This Fisherman’s Rib cowl was knit with just one skein of Martta the Merino in color Terracotta. Do you have a. pattern for the garter stitch scarf shown in Pearl on today’s post? Love it!!! 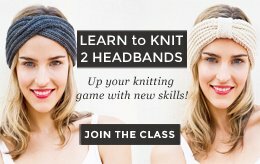 The video tutorial for the garter stitch scarf is coming out next week, but for now, you can check out the How to Knit series here: http://sheepandstitch.com/learn/how-to-knit/ It’s goes over the exact same steps as what we’ll cover in the garter stitch video. To knit a scarf, you would cast on, then knit all of your stitches. Then, when your scarf is the length you like, you can cast off. It’s just three steps! The number of stitches you cast on depends on how wide you want your scarf to be. So, you can try casting on, and once your cast on stitches are the width you want your scarf to be, then stop casting on and start knitting! I hope that helps! But if you want to stick around for the tutorial for the scarf and have it laid out really clearly, check back next week! Or, sign up for the newsletter and the video will be announced there too!